Land Gallery – Land is an art gallery and gift shop located in the historic Mississippi Neighborhood of Portland, Oregon. Jessica Lynch’s show closes this Sunday, April 28th. Come on in and see her great collection of original work. She’s brought us a stunning collection of mixed media pieces of ink, gouache, tissue, mimeograph carbon and oil pastel on pine to the gallery. The Papersmith UK has a feature interview on our May show artist, Graeme Zirk. Graeme is debuting all new work exclusively at Land Gallery, and it is his first solo show in the United States. Come on out and meet Graeme and see his work Friday, May 3, 2019 from 6-9pm. Candian-based illustrator and designer comes to Land for his American debut Friday, May 3rd, from 6-9pm. “Doozy” is a collection of new work by Vancouver based Illustrator and Artist, Graeme Zirk. Webster’s defines “Doozy” as “an extraordinary one of its kind” but present day vernacular would suggest otherwise. It’s a once pleasant word that has been adapted for sarcastic, pejorative purposes. As a result, we’re left with a paradoxical turn of phrase that leaves us our own devices to determine whether something is great or godawful. Graeme Zirk is interested in creating work with a sentiment and aesthetic that is hard to place. Pieces can feel both refined and flawed, pleasant and melancholic, bold and doubtful, direct and cryptic. Regardless of perception, the show promises to be a real doozy. The creative force behind Slow Loris Studios joins us in March and April for an intimate show of all new work. She’s bringing a stunning collection of mixed media pieces of ink, gouache, tissue, mimeograph carbon and oil pastel on pine to the gallery. Opening reception Saturday, March 30, 2019 from 2-5pm. Show runs in the gallery March 31 – April 28, 2019. We were thrilled at the reception for Peter Nevins’ amazing woodcut block prints this weekend. His show is full of beautiful colors and hand-cut imagery. The show is up in the gallery through March 17th. We’re open daily 10a-6p. 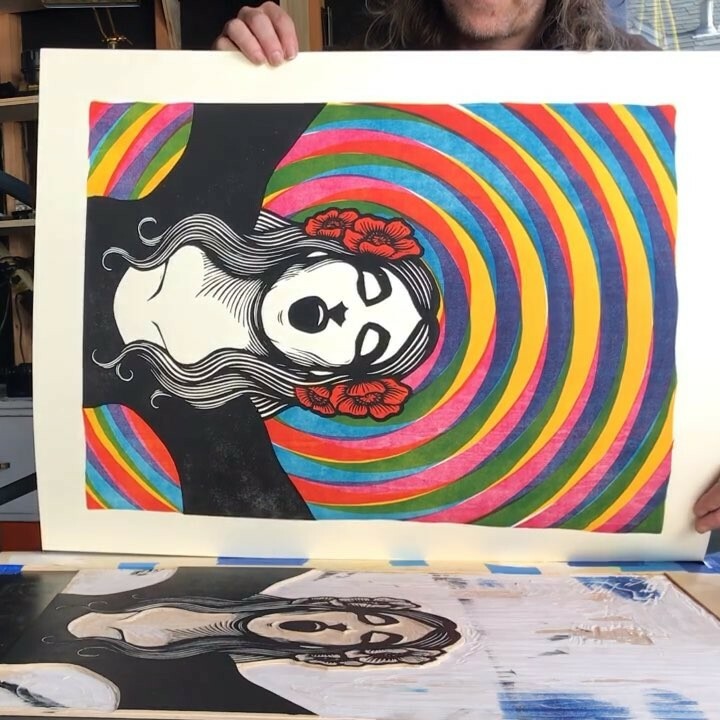 Peter will be brining a large collection of his latest prints for an exhibition and will be on-hand to discuss his techniques. His process of carving into giant wood blocks to create multiple layers is a true wonder to behold in person. You’ll see the depth texture of each layer come to life. Getting to see the original wood cut by his hand is a real treat. Be sure and try to come to the opening Saturday, February 16th from 2-5pm. All of the framed originals from Mimi Williams wonderful print show are now available to view and purchase online at our sister site, buyolympia.com. We’re thrilled to welcome Peter Nevins to Land on Saturday, February 16th from 2-5pm for a free printmaking demonstration. Thank you to everyone who came out this weekend to see Mimi Williams art exhibition and a special thanks to all the folks who attended her free printmaking workshop. We had a wonderful time hosting her and all of you! Her show of original prints will be up in the gallery through Sunday, February 10th — so be sure and swing by and check them out if you haven’t yet.